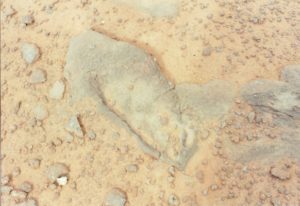 In the September 1989 issue of the Creation Research Society Quarterly, Rosnau, Auldaney, Howe and Waisgerber published an article concerning the “quasi-human ichnofossils” found at an Indian roadside stand near Tuba City, Arizona. 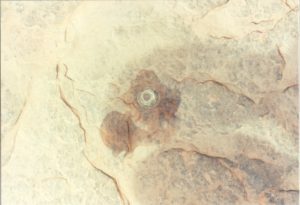 They did a second follow-up report in the December 1989 issue of some other tracks found nearby. 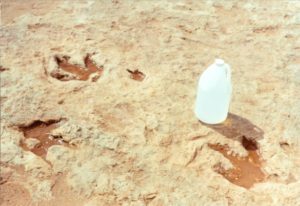 These tracks are about 100 feet away from a large set of dinosaur tracks. 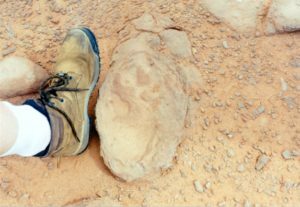 While we were conducting our Grand Circle geological tour in Arizona and Utah, we decided to see these tracks for ourselves. They can be found on Route 160 just before you get to Tuba City. 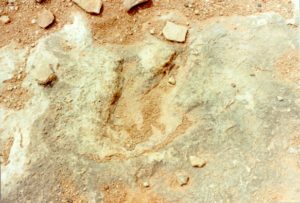 The tracks are located on top of a mesa, just after you crest a hill on the left-hand side of the road. 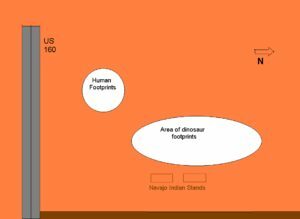 The Navajos who run the stand were quite friendly, and were eager to show the dinosaur tracks. The fellow who took us to see the tracks knew about the human prints, but hadn’t seen them himself. He said his cousin knew where they were. 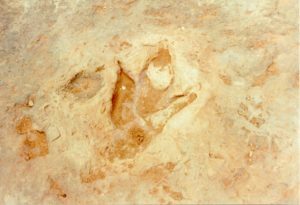 As we had just taken a Grand Canyon tour with Allen Roy of the Creation Research Society, we had some general directions how to find the human prints. The dinosaur tracks were unmistakable, and were all over the place near the roadside stand. The immediate area looked like a scene just shortly after a dinosaur square dance in the mud. 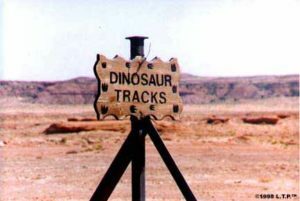 An area to the right of the stand contained several track sequences of some fairly large dinosaurs. 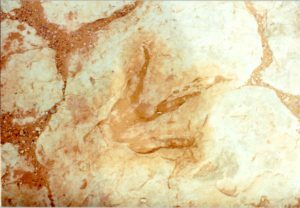 The picture at the left shows six or seven very distinct dinosaur prints. The guide showed us what he thought was an allosaurus talon. I rather doubt it was one, but I suppose it could have been. 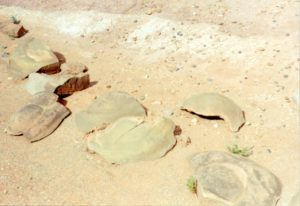 The entire area was strewn with brightly colored stones, and concretions. He showed us a spherical concretion called a “Moki marble.” I told him in jest that it was an eye of a whale. It sure looked like one. After the tour ended, we went on our little expedition to find the three tracks that Allen Roy told us about. After a considerable amount of searching, I finally found three tracks that I thought were the ones he described. 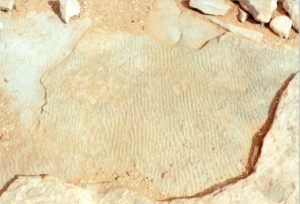 All three appear in strata where the surrounding rock is partially eroded away. Apparently the weight of the foot caused these prints to be slightly harder than the surrounding mud. 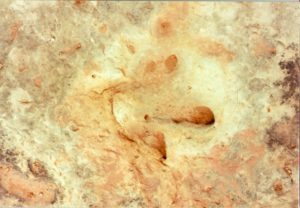 Although these prints are in quite poor shape, I think you could make a fair case for the first two being human footprints. The third one is in such bad condition that I hardly think it should be considered. But after looking at Allen Roy’s pictures, it appears the ones we discovered are different than his. After finding these prints, I went back and talked with the guide again, wanting to show him where they were. 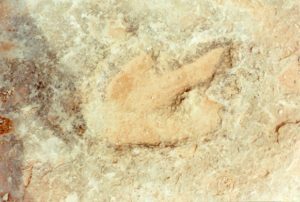 He began to then tell me that prints like these are found in quite a few places in the area, some in nearby caves. He also mentioned that some of them are giant-sized, and that they have tribal legends of giants who lived in the area. 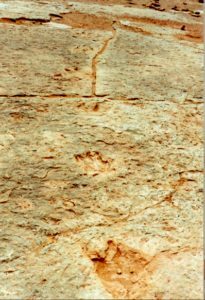 When we returned to the area, the guide found this track sequence, which I think, contains the best prints of all. I think that you can make a case that there is a sequence of about five or six human prints here. 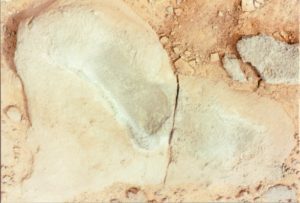 Now I would admit that there is really nothing here that would convince a die-hard evolutionist that the only explanation for these tracks are that humans made them. 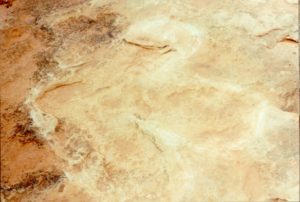 Tracks are subject to interpretation, and some people might say that these are carvings or natural rock formations. Also, according to the researchers who did the original study, the best tracks are found on the other side of the road, and we didn’t have time to try to find them. 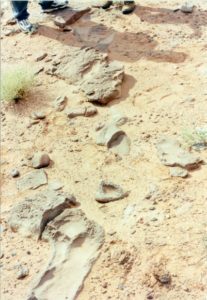 If we were to do this over again, I might like to spend a week with the Navajo to find out where the other tracks are, and pick their brains about their legends of ancient men and the monsters they may have battled. An excellent book that talks about legends of dinosaurs, elephants, mammoths, volcanic eruptions and catastrophes is Vine Deloria’s book, “Red Earth, White Lies,” available from <http://www.amazon.com>. These tracks are fun to look for and speculate about their origin. 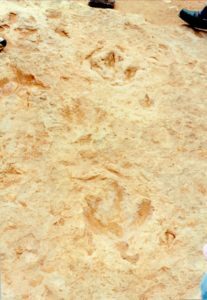 Those of us who believe that the dragons of legend and ancient history may have been the dinosaurs of science might have our beliefs reinforced by the presence of these tracks. Those who are committed to believing otherwise certainly could find alternative explanations if they wanted to. 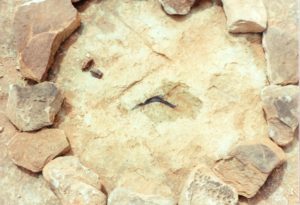 This is true for these tracks as well as the more famous ones found at the Paluxy River near Glen Rose, Texas. Evolutionists think that they can say that evidence of this sort is “debunked” if they can create a naturalistic explanation for it. I don’t think so. 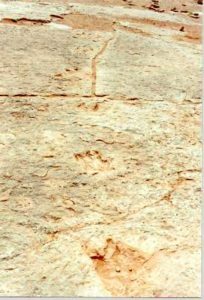 We do not have to establish an absolute incontrovertible case in order for us to conclude that humans could have made these tracks. We only have to establish that the hypothesis is reasonable. 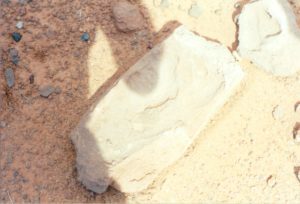 In 2011 and 2016 we visited the site again and found more tracks. 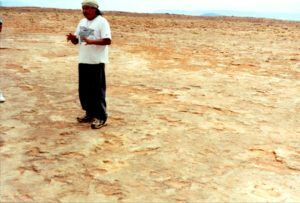 When we paid the guide a nice tip, he took us to a different site where the Navajo has a historic site showing petroglyphs.